Explore the length of Vietnam, from the northern capital Hanoi to Ho Chi Minh City in the south, on this 12-night holiday. See age-old temples and royal tombs, sail emerald bays, stay with a Vietnamese family on the Mekong and tour historic port cities. This trip is the perfect option for families looking to discover one of Southeast Asia’s most fascinating and diverse countries, offering a blend of adventure, history and comfort. 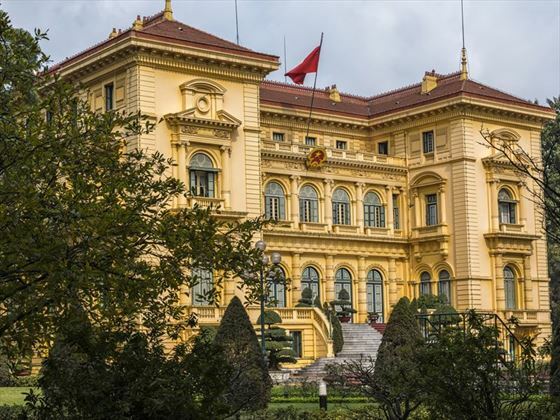 Highlights include spending the night with a family in the Mekong Delta, sailing the island-studded Halong Bay and visiting royal tombs and palaces in Hue. You’ll also get the chance to travel on an overnight sleeper train, sail down the Perfume River and wander the quaint riverside town of Hoi An. 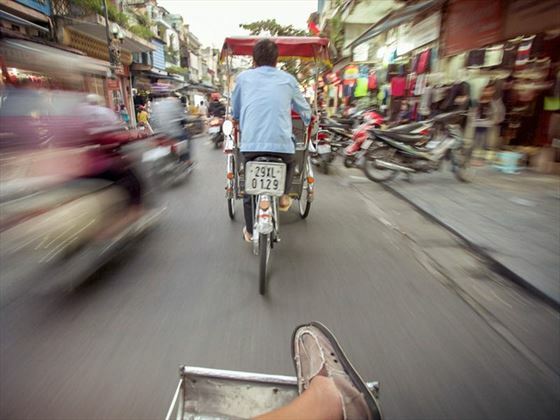 Your trip starts and ends in Vietnam’s two major hubs, Hanoi and Ho Chi Minh City (INT). Explore Hanoi’s Old Quarter and visit Ho Chi Minh’s stilt house and mausoleum. 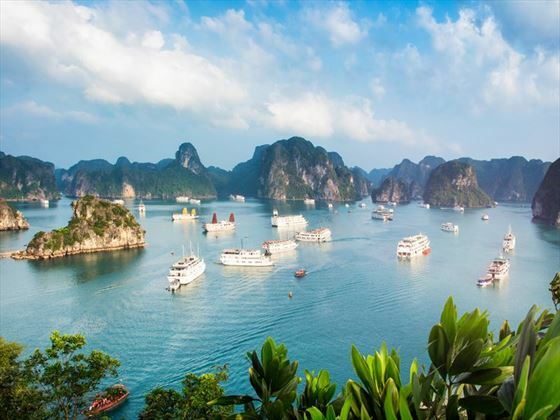 Take an overnight boat cruise on the UNESCO World Heritage Site, Halong Bay. 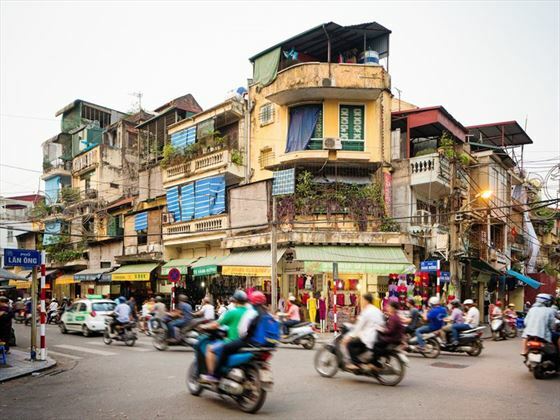 Experience the frantic blend of old and new in Ho Chi Minh City. 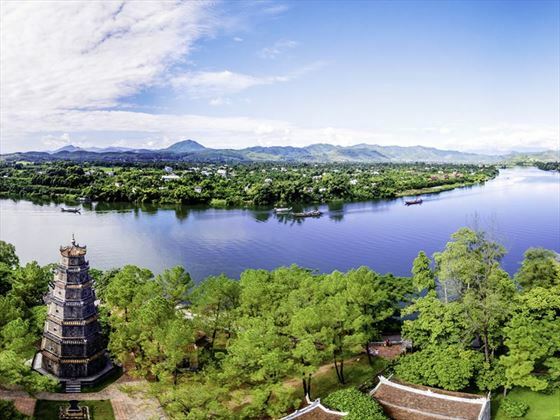 Sail down the Perfume River and visit royal tombs and imperial cities in Hue. Travel on an overnight sleeper train through the countryside. Stay the night with a Vietnamese family on a trip to the stunning Mekong Delta. Tour Hoi An, a port city filled with history. Welcome to Vietnam! Your adventure begins with a transfer from the airport to your hotel, where there will be a welcome meeting at 6pm, followed by a group dinner. If you arrive early, get out for a taste of Vietnam’s lively capital, which boasts over 1,000 years of history. The best place to start is the Old Quarter, which is filled with Vietnamese tubular houses and shops, street vendors and cafés. Stop for a coffee on a tiny, pavement-side stool and watch the world go by. Enjoy a full-day tour of the city and learn about its past. You’ll visit the Ho Chi Minh Mausoleum, museum and presidential complex, where the country’s famous revolutionary leader lived in a modest stilt house. Take a trip to the Museum of Ethnology to learn about Vietnam’s diverse ethnic background and visit the ornate, Chinese-inspired Temple of Literature. Note that the Ethnology Museum is closed on Mondays, in which case you’ll visit the Women’s Museum instead. Have lunch at KOTO, a restaurant that employs underprivileged young people from Hanoi, preparing them for a career in hospitality. Your evening entertainment is a traditional water puppet show. This artistry dates back centuries, when it was performed in flooded rice paddies in the Red River Delta region. You’ll experience a mix of puppetry, music and lights set on water which tell the story of Vietnamese legends. Today you’ll take a minibus to the UNESCO World Heritage Site, Halong Bay, the journey takes four hours. You’ll take an overnight cruise on the bay, which is dotted with over 2,000 limestone karsts and secret caves, forest-topped islands and floating villages which are home to people who’ve lived in the bay for generations. You’ll have the chance to visit caves filled with stalactites and stalagmites, swim in the South China Sea and watch the scenery from the top deck. The accommodation is a rustic Vietnamese junk boat with twin-share cabins which have air conditioning and private bathrooms. There’s a dining room where you’ll have meals, as well as a bar. Due to new government restrictions on the number of boats allowed in the bay, be aware that you may be placed on a larger vessel with 12 cabins alongside other groups. Disembark and return to Hanoi by bus for the overnight train journey to the ancient city of Hue. The journey is an adventure in itself and you’ll travel alongside locals, sleeping in four or six berth cabins with seats that convert into bunks. Bedding is provided and there’s usually a dining carriage, but it’s a good idea to bring snacks and warm clothes for the journey. Note that you may be sharing a cabin with passengers not in your party. Arrive in Vietnam’s former capital and seat of the Nguyen Dynasty from 1802 and 1945. 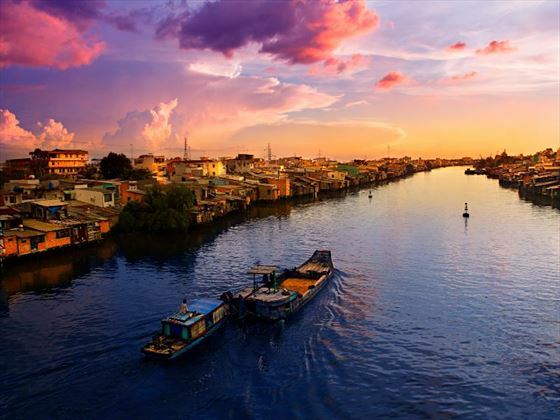 Hue is a UNESCO site which straddles the Perfume River and is stuffed with history. Tour the 19th century Imperial City and Forbidden Purple City, where emperors once ruled. The walled complex is surrounded by a moat and was almost completely destroyed during the TET Offensive. You’ll also visit the decorative Thien Mu Pagoda, a Buddhist monastery that has been active since 1601. One of the most interesting displays at the pagoda is a car belonging to a former monk, who self-immolated in protest over the harsh treatment of Buddhists. Today you’ll take to the water with a boat cruise along the Perfume River. You’ll make stops to visit the royal tomb of emperor Tu Duc, which is set in beautiful gardens with a lake and frangipani trees. You’ll also have a chance to visit Minh Mang’s tomb, which is known for its impressive architecture and peaceful forest setting. Say goodbye to Hue and travel four hours by bus to Hoi An. Along the way, you’ll traverse one of Vietnam’s most scenic roads, the Hai Van Pass, which looks out over cliffs to the sea. Make a pit stop at China Beach before arriving in UNESCO-listed Hoi An. This pretty port city was a key colonial trading station dating back to the 15th century and features a rich mix of European, Vietnamese, Chinese and Japanese architecture. Get your bearings with a guided orientation walk around the old town and then continue sightseeing independently. Have a meal by the river, shop in the tree-lined streets or simply relax at your hotel. 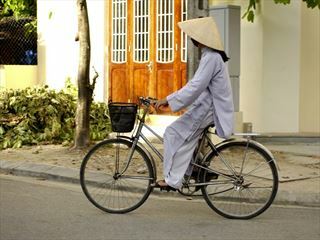 Optional activities include Vietnamese cooking courses, bike hire and boat trips. After breakfast, head to Cua Dai, a nearby sandy beach lined with palm trees. 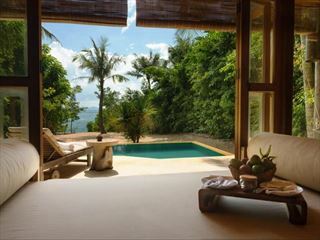 Enjoy views of the Cham Islands, swim, sunbathe and have a picnic lunch. In the afternoon, you’ll head back to Hoi An for a wonton-cake-making class and free time to visit Chinese merchant homes, cross the colourful Japanese bridge and hop into temples. The entire day is yours to enjoy in Hoi An. You can rise early to take in the sights and smells of the morning market, hire a bicycle and head out to the countryside or spend the day on Cua Dai beach. Don’t miss the chance to do some shopping, Hoi An is especially known for its silk tailors, who can create a custom, handmade outfit for you in less than 24 hours, or ship it straight to your home country. Sample some tasty street food, take a cooking class or even a day trip to the nearby UNESCO site My Son, which features ruins of the Cham civilisation dating from the 4th century. 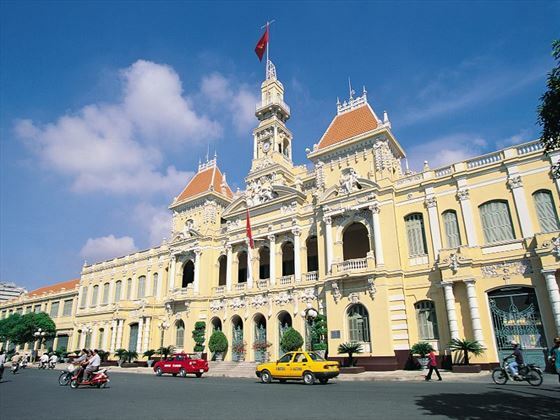 Fly to Ho Chi Minh City, Vietnam’s largest metropolis, formerly known as Saigon. Get to know this bustling city, which offers a blend of Vietnamese and colonial history contrasted with modern malls, fancy boulevards and over eight million motorbikes. Head out on a guided orientation walk, where you’ll visit Ben Thanh Market, which sells everything from clothes to antiques and street food. Spend the rest of the day exploring independently. Visit China town and its glittering temples, tour the moving War Remnants Museum or the iconic Reunification Palace. Leave the city for an overnight trip to the Mekong Delta, Vietnam’s fertile rice bowl. The bus takes you two and a half hours to Ben Tre, from there you’ll take a boat trip along the Mekong’s maze of waterways. You’ll be surrounded by lush green rice paddies, orchards and villages and get the chance to learn about the area’s industries. Later, you’ll head to a homestay, where you’ll spend the night with a family and sample some regional food. Accommodation is basic, with camp beds in dorm-style rooms with mosquito nets and shared bathrooms, a true Mekong experience. Get up early for a trip to a Mekong market where you can watch locals trade before heading back to Ho Chi Minh City by bus. The rest of the day is yours to explore, wander around District One, which has the most well-known city sights and museums, sample some Vietnamese street food or do some shopping. There are no activities planned for the day and you can depart whenever you like. If you have time before your flight, squeeze in some more sightseeing, shopping or have a relaxing Vietnamese massage to end your trip. Nine nights in a hotel, one overnight boat, one night at a homestay and one overnight sleeper train. Boat, minibus, overnight sleeper train, plane, private bus. 8 breakfasts, 3 lunches and 3 dinners. Activities: Hanoi Temple of Literature, water puppet show, Ho Chi Minh Complex, including stilt house and museum, and Musuem of Ethnology. Halong Bay overnight boat cruise, Hue Imperial Citadel, royal tomb and perfume river cruise. Hoi An orientation walk and ancient town entrance. Ho Chi Minh City orientation walk and Mekong Delta local market visit.